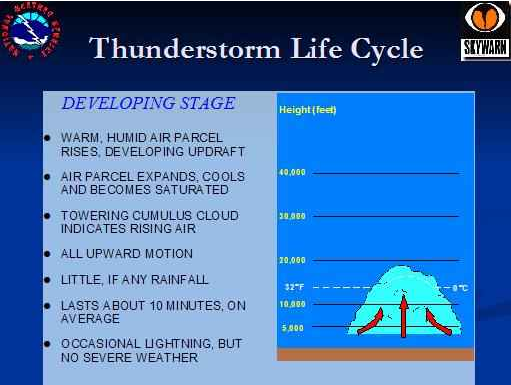 All these storms got me thinking about why thunderstorms happen. 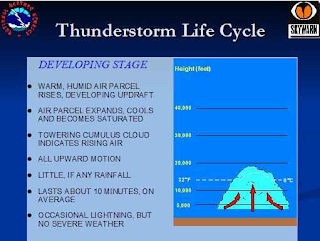 I found these slides from a quick Google search on "thunderstorm life cycle." 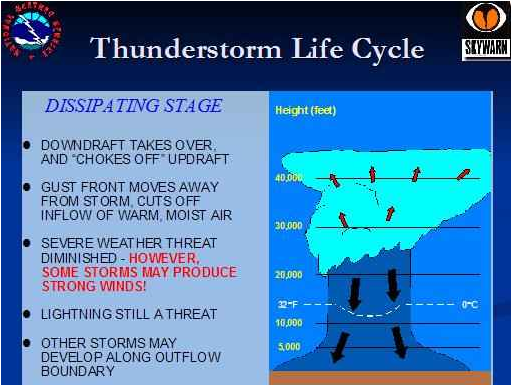 The below slides are from Severe Storm Spotter Training (http://www.wrh.noaa.gov/mso/train/img0.html from the National Weather Service Western Region Headquarters). Developing Stage: These are the white, fluffy clouds you see on warm summer days. They are formed by convection during sunlight hours. There's little convection over southern Lake Michigan in the summer which is why you typically don't see fluffy clouds over the lake. In the summer you do see them on the northern part of the lake where the air and lake temperatures are closer or the lake is warmer than the air. You see them over the lake in the fall when the lake is warm and air cool. You also see them off the east coast of Florida over the Gulf Stream (relatively warm water). Mature Stage: These are the storms to watch out for. Scattered storms are caused by convection that lifts the moist air high enough to cause condensation into rain. 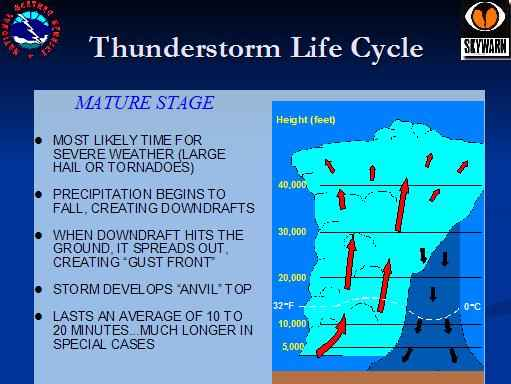 Lines of thunderstorms are caused by a cool front which lifts the warm air into the atmosphere. The warmer the air and faster moving the cold front, the higher the lift. Falling rain creates the wind gust, multiplied by the speed of the cold front. 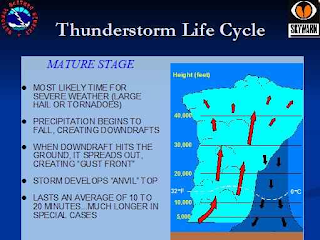 That is why a fast moving cold front creates short lived but potentially violent storms. The updraft may change or reverse the prevailing wind, hence the phrase "calm before the storm." Dissipating Stage: The sloppy end of a storm. You might see the "anvil" falling over on itself. A cold front will move it along replacing it with relatively cooler, drier air. I've observed the largest raindrops are just before the rain stops. I find weather fascinating to watch. When sailing you learn to appreciate the subtle changes to the weather. If you understand and can predict what will happen next, you'll have more confidence about uncontrollable weather and can appreciate it's amazing power and beauty! Weather Measuring Instruments for safety For a weather reporter they need a full range of weather gadget and that must be a branded items. Without a renowned shop you can’t get them all, you need good quality cables, gadgets, hi configured computer, without these accurate weather forecast for them is not possible, and you must find a good weather stationery shop. 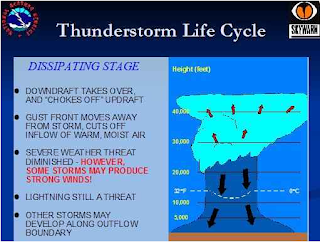 Get your family to understand the thunderstorm or severe weather plans that you have for them. Everyone need to know what to do, where to go, what to grab, and everything else associated with your plans.